As the first state to legalize cannabis, Colorado has a unique history with the marijuana movement. As a result, The Mile High 420 Festival draws advocates from around the world. Re-imagining what the holiday has represented in the past, our goal in 2018 is to continue to fight the stigma while celebrating the booming cannabis industry here in the Mile High city. 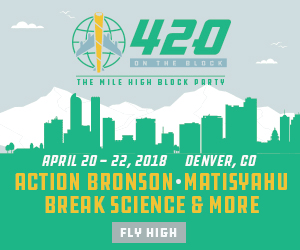 With national acts, local musicians, and the best comedians in town we’re pairing entertainment with yoga, meditation and wellness activities that will make you stop and re-think what 420 really stands for. Join us with over 50,000 people as we celebrate the cannabis culture and the future of what continues to be is a flourishing industry for our nation. Embracing the synergy of cannabis and wellness a fully interactive experience during the early hours of the festival with a stage just for meditation, yoga and fitness.